The story of the Southside Elementary Writing Focus is the story of how an outsider with community connections and a faith in teachers provided an opportunity for the staff at one school to inquire into the nature of writing instruction and ultimately to redesign curriculum and effect changes that reshaped the writing culture at a low-performing school. 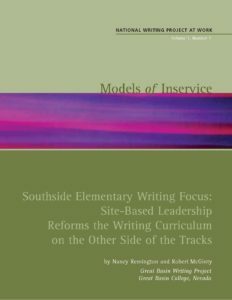 Southside Elementary Writing Focus examines the process that fostered teacher leadership as a way of strengthening instruction and meeting some of the challenges typical in a school with a high minority student population, high student transiency, and low test scores. After five years, the key components of the initiative remain intact. The seeds for the initiative were planted in 1997 by Nancy Remington, then an English instructor at Great Basin College in Elko, Nevada, and a teacher-consultant with the Northern Nevada Writing Project (NNWP) in Reno. Over the course of two years, fourteen Southside teachers collaborated in designing a school-specific, subject-specific, and teacher-specific professional development program that, since its inception in 1997, continues to influence instruction and foster cohesiveness among teachers at Southside School. Project Outreach grant monies provided the catalyst for Nancy’s work. Elko County School District supported the effort by paying for release time for substitutes. The work Nancy initiated at Southside, in turn, became the beginning of a writing project culture in the community that ultimately generated a new writing project site, the Great Basin Writing Project. And perhaps even more important, because of the hard work of the Southside staff on projects like the Southside Elementary Writing Focus, in 2004, Southside Elementary was designated a “Distinguished Title I School” by the National Association of Title I. The story of the Southside Elementary Writing Focus is a tale about community connections, teacher commitment, and the critical components of timing, opportunity, and personality. It is loosely a model for professional development in any school. The success of the initiative was contingent on the staff’s eagerness for professional development, district support, and Nancy’s leadership and her connections with the school district administrative staff—factors that are helpful to have in place but are difficult to guarantee or impose.